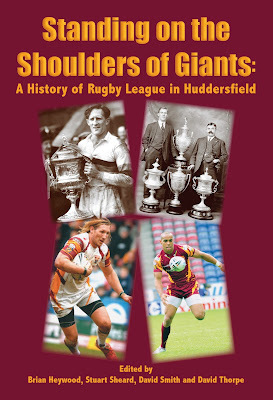 In 1676, Isaac Newton wrote: ‘If I have seen further it is by standing on the shoulders of Giants.’ It seems an appropriate metaphor for a book that relates the achievements of ‘Giants’ on which the Huddersfield Giants club and game of rugby league continue to be built. The first ‘Giants’ who founded the Huddersfield club in 1864 were quickly followed by the Huth brothers of the 1870s, who took the quality of local rugby to a new level. In 1878 Huddersfield began 114 years at their Fartown home, developed by ambitious committeemen into one of the great northern sporting arenas. In 1885, club President Charles Holliday inaugurated the Holliday Charity Cup for local clubs, which remains the longest-running amateur rugby competition in the world. Probably the greatest Giant of them all was the slick, innovative Harold Wagstaff who jolted the game from a static, set-piece, forward-fest into a more flowing, fluid, attractive spectacle. He captained the 1914 England team that won the Ashes and on his return led Huddersfield’s Team of all Talents to all four trophies in 1914-15. This team included Albert Rosenfeld, whose 80 tries in 1913-14 remains a distant benchmark for aspirational wingmen. It also included Douglas Clark, rugby international, world wrestling champion and war hero, whose extraordinary courage and spirit continues to inspire. Following in the wake of such Giants, Len Bowkett led Huddersfield to League and Challenge Cup glories that raised local spirits during the Great Depression. A host of heroes arrived after World War II, spearheaded by Australians Johnny Hunter, Lionel Cooper and Pat Devery. Scot Dave Valentine lifted the inaugural Rugby League World Cup in 1954, and master tactician Tommy Smales captained Huddersfield to the League Championship in 1962. Collectively, they inspired a generation of fans who stuck with the club when the collapse of local manufacturing industries was almost mirrored by the demise of the club. Foremost among these supporters were Keith Burhouse and his family, who led superhuman efforts that sustained the club until better times arrived in the form of the McAlpine Stadium and, shortly afterwards, Ken Davy. Chairman since 1996, Ken Davy is a modern-day Giant whose input has driven the club’s progress to the top of the game as the Leaders of Super League in 2013.. The unique decisions of 29 August 1895 at the George Hotel are forever etched into the histories of the town and the sport – the only sport that knows exactly when and where it was born. In 1973 the British Amateur Rugby League Association (BARLA) was also founded in the town, led by officials from the Huddersfield and District League. BARLA has developed a progressive league structure for amateur clubs, encouraged women’s rugby league, and remains one of the game’s significant developments. Embellished by much original research, this book relates original stories and new perspectives on all of these developments. It is about the broad shoulders of Giants on which the modern club and game stand. 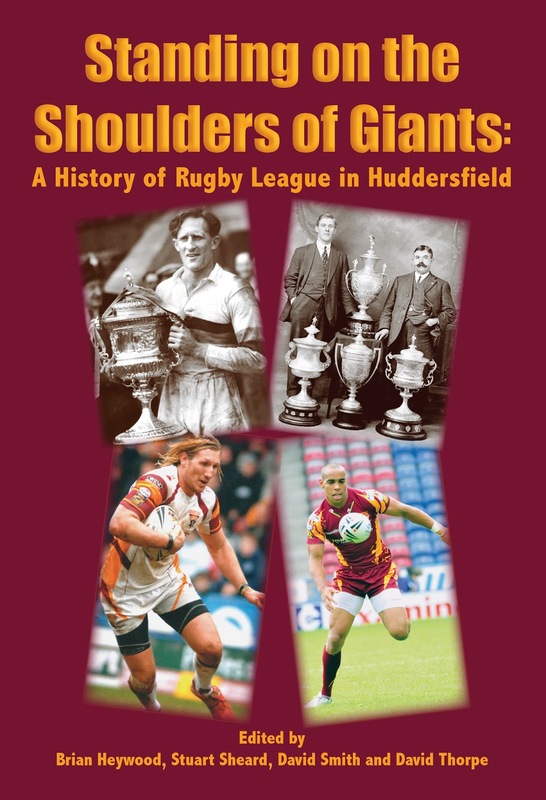 Priced at £10 the book will be available, at the beginning of June 2015, from the Huddersfield Giants Club Shop, Waterstones and WH Smiths in Huddersfield, the Tolson Museum and Huddersfield Tourist Information Centre.